Wow, what a great idea to market the game! All the above ingredients are available in my grocery store except for gelatin sheets, which I've learned it's more commonly available in Europe than the United States. But I may buy gelatin sheets online from Walmartone or Amazon. I don't have an electric hand mixer but I may buy it from Target. I'd like to suggest the following equipment for the bakers planning to make the Red Berry Cake. Use a hinged baking pan if you have it. The final product in the video looks too clean to have been removed from a regular baking pan. 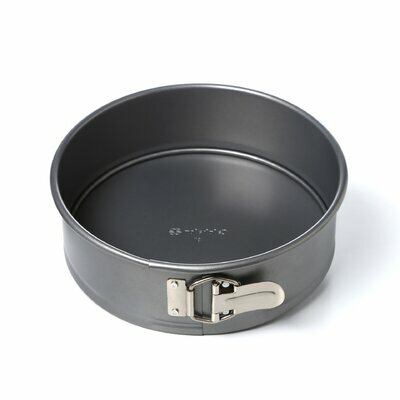 Here's what a hinged baking pan looks like. It's essential to make cheesecakes and layered cakes. LOL, I already have a recipe for chocolate chip cookies. If I add another cup of bittersweet chocolate chips, then I will make brownies. Eureka!